Soul Hollywood redefines traditional southern cuisine by embracing the flavors of the South, while combining them with contemporary elements. Executive Chef Giulian Jones takes an inventive approach to the menu using seasonal ingredients, unique spices and flavor profiles from international influences. With Southern spirits and cocktails, craft beers and a carefully curated wine selection, Soul embodies the warmth of true southern hospitality while offering a modern and inviting environment. ​Hollywood Blvd. & Sycamore Ave.
We have a parking option available down the sidewalk at The Roosevelt Hotel for $10 per car (max. 3 hours). Food was awesome. My husband ordered the small plate of smoked meats and the portion was perfect, so I can't image the entree size, must be big enough for two. I ordered off their happy hour, which is daily! Good food and great service. I will definitely stop in the next time I am in the area. Dropped by here with some friends from Germany who had never experienced Southern cuisine. They loved it. We ordered a sampling of the menu and shared. The BBQ platter is EXCELLENT and plenty for 2-3 people with a few sides. Another fave was the chicken pot pie. This was my second dinner here and I've done lunch two times as well. I'll keep coming back. We specifically wanted a low-key non-scene place and this was it. If you like comfort food, this is a great destination. Mid afternoon Sunday, order was taken promptly. 25 minutes later asked server where our food was, she had no idea. When it did arrive, it wasn't what I ordered. Partner ate alone and finished before my correct meal came. Check was discounted $5. Just a disappointment. Horrible experience. We will never go back. Side note: I've been going to the LA Fitness across the street for the past 4 years and NEVER noticed this place. It was clear that the owner/company has no experience with hospitality. Nothing was consistent (layout, decor, music, lighting, service, menu, etc). My date and I both asked one of the waiters who/what company owns the place and he gave a mixed answer of "I don't know" with "they don't own other restaurants." Waitress was ok at the beginning but then non-existent for the second half, and I had to leave the table and go downstairs to find her for the check (which I couldn't because she was hiding somewhere near the kitchen). Worst $175 I've ever spent. Stay awayyyyy. Friendly and fairly prompt service. 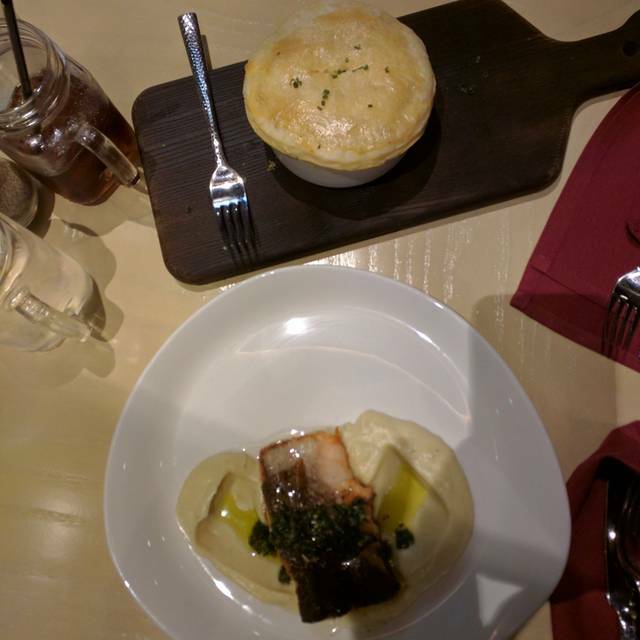 Two main dishes - a very small chicken pot pie and a tiny piece of fish with a thin smear of mashed potatoes - and two soft drinks came to $60 with tax and tip. I've had better chicken pot pie at DuPar's for the same price, and theirs is twice the size. Good food, good drinks, elegant atmosphere. We enjoyed the BBQ sampler appetizer, fried chicken, & Mac n cheese. They were delicious (the Mac n cheese especially). Unfortunately we ordered the beignets for dessert. They were raw in the middle. I literally was pulling raw batter out of my mouth. When the bill came and the beignets were still on it, and we had to ask for it to be removed since the dessert was inedible. They have work to do. We were pretty disappointed with our total experience. Other than the Hostess being super nice and welcoming it was pretty much downhill from there. The service was very very slow and it was not even busy, maybe 4 tables counting ours and a couple of guys sitting at the bar. Drinks took forever and so did the food. My husbands Fried Chicken was average and my Brisket Pot Pie was a mushy blob of filling covered with a doughy half baked puff pastry. Everything needed just a touch of salt and more flavor. I sent back my COLD mashed potatoes and was still charged for them. The waitress knocked over an ice bucket full of ice and water right by our table, which splashed up and wet my husbands feet. No apology or offer of a towel or anything to him. To top it off the runner who brought our food got into a verbal altercation with the girls at the table next to us. We heard the whole thing and he was completely out of line. Worst dining experience I have ever had. Made a reservation for 8 people for 5.45pm and we were seated 30 mins late even though the table we were eventually seated at had been sitting empty for 10 of that. Ordered drinks while we waited which didn't arrive until we were seated. Ordered the food to which half the people didn't get. 3 people got no food at all, 4 got bits of their meal, either their appetizer or the side to their main and only 1 got their whole meal which were the sliders. They asked if they came with lettuce and tomato and was told a la carte so asked for none but came piled high and the buns could have been used in a hockey match as a puck they were so stale and hard. Cornbread came out burnt also. No one came by to check after food was brought out so we continued to wait until one of us actually had to go and find someone. We had to cancel the missing food as we were late for a show by this time but somehow all the food was on the bill. Even when we had to cross out what we didn't get a couple of items were still left on there and he ran our card. When we asked if he could speak to his manager he said he had already comped a lot of the drinks which he hadn't, he comped 1 because he forgot to to bring it when it was ordered. I'm glad our show turned out great as this place really ruined the start of the night. Won't be back and definitely won't recommend. The service was very slow, the server never brought out food and when the runners did- it was a "food auction", who got what, is this yours etc. drinks super slow and only saw the waitress twice. The atmosphere on the upper level is really lacking, boring and honestly felt very separated from the rest of the restaurant. Just not a good experience, food was just "okay" for the $270 we spent. I made a reservation for a business lunch without knowing anything about the restaurant beforehand. My boss and the prospect we were entertaining were impressed. Nice place especially for this location. Good overall but not foodie level. Food and drinks, slow coming. Juice is small. Food is very, very good, portions are small. Steak and lobster was cooked to order, very flavorful. Was disappointed with the portions. Wow! The lobster must have been very small. Bread pudding was a tad dry. Very impressed overall. Preferred the food/portions of 10 years ago. I had high expectations for this place but the food was very average and the service was way too slow. Both the food and drinks take a long time to come but the environment was nice. So overall it's just ok. I really enjoyed this place, and it's a welcome addition to Hollywood, where there aren't a ton of non-chain restaurant options. The bbq sampler appetizer is a must try. They also have an excellent wine list here, and every dish has recommended pairings that you can get by the glass. They have just opened and think they need more time to get their act together. The service wasn't great. The main thing about enjoying a restaurant is the food. Soul does not let you down there. We started with an appetizer of crab in phyllo. This may be the best dish I have had for years. The crab was delicious but the sauce was unbelievable. If there were no other customers in the restaurant, I would have licked the plate with my tongue (it was that good!). We also had the salmon and halibut entrees. The fish was cooked perfectly but what was really stupendous was the parsnip puree. It was almost as good as the crab in phyllo. The ambience was really nice. A great selection of music was played loud enough to enjoy but not loud enough to prevent us from having a nice quiet conversation. Bbq platter, smoked fried chicken, cast iron skillet mac n cheese & chocolate ganache were awesome dishes! Absolutely everything was fantastic. The food, service and ambiance all 10s! I think Soul has potential, but as it's very early days for this restaurant, it needs work. The appetizer of crab in phyllo was so so. Our dinner was both of the fried chickens. The serving is 3 pieces and a biscuit. The first time out they were cold, so we sent them back. The regular fried chicken was good, but the smoked friend chicken was chicken that was smoked and then put in the fryer without a coating. We got 2 breasts and a leg, and my husband said the drumstick was good, but the breasts were entirely dried out. The mac and cheese with bacon was far too rich, and there was just too much of the cheese sauce to macaroni ratio for my taste. We'll go back, but not for a while. 5 girls celebrating one birthday and just a girls night out. We all had cocktails and tons of food and a bottle of wine too! I think we even did a shot of tequila too! We enjoyed our dinner of catfish, greens, cornbread, halibut, black eyed peas Salad . We caught the end of happy hour and really liked the squash pizza and buffalo cauliflower appetizers! Prices were very reasonable. Will definitely come again! Very nice ambience, music and a great vibe! Try it! You won't be disappointed. This place is amazing! Three levels of dining including a great bar area. The food was fantastic. Creative. Big menu with lots of variety. The smoked chicken was superb. An extensive wine list and full bar makes this a great place to meet for a drink as well. Service was friendly and attentive. Can't recommend this new addition to Hollywood Blvd enough. Already looking forward to going back and trying other menu items. The food is delicious and the service is outstanding. The staff is very friendly and knowledgeable about the menu. Cannot wait to go back again. The food was amazing. My new goto spot. The smoked fried chicken is my favorite. Also the beet burger is also very good. I've been waiting for soul to open and now it's here. I'm so Happy. A fantastic new restaurant that is warm and friendly and best of all the hostess Yelang is a true gem.